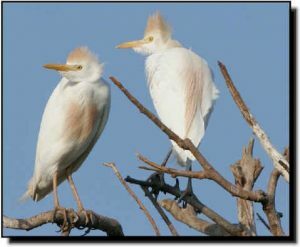 Comments: Cattle Egrets, originally from Africa, first arrived in the Western Hemisphere in the 1930s and quickly spread throughout North America. They are often observed in close association with cattle and following tractors searching for fleeing insects and small mammals. They have shorter bills, necks and stockier bodies than other white egrets. The dark bills of juveniles change to yellow as they become adults. During the breeding season, adults develop orange-buff colored crest, back and breast feathers. Their legs turn from a darker green to yellow or pinkish-red. Like other species of herons and egrets they nest colonially, often in mixed-species flocks and primarily in trees. They are often found in large breeding colonies.